Your Printix Cloud Print Management Service is established by deploying Printix Client, our small piece of software, on your computers (Windows and Mac). Any printer discovered in your network is presented to you in our web interface Printix Administrator. Your configuration data is stored securely in your Printix Home in the cloud, and so are print drivers that Printix Client uploads to your Printix driver store. Your Printix Client is built to only work with your Printix Home and users are required to sign in before use. Device settings (Paper trays, Duplexer, Stapler, Hole punch, and Output bins). Printing defaults (Finishing options, Print 2-sided, and Print in black). Remotely Add, Update and Delete Printix managed print queues. Use Groups to deploy and grant exclusive access to printers based on users’ group membership. 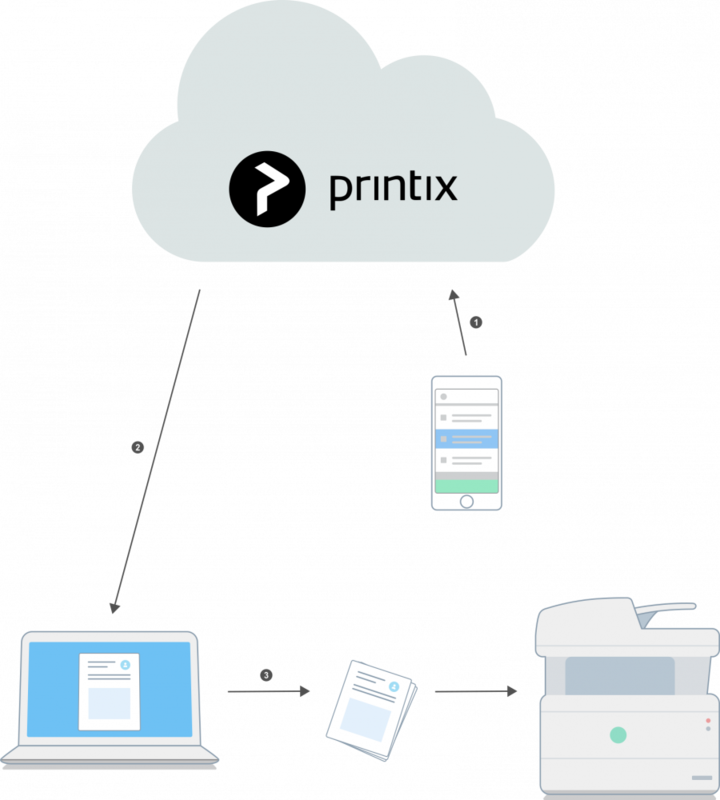 The secure and flexible methods of Printing with Printix are achieved by having Printix Client temporarily store print data encrypted on the computer and informing Printix Cloud about the document. Users can print directly (as usual) or they can print securely and release documents from Printix App on their phone, tablet and computer. Pending documents can also be stored in your own secure cloud storage (Azure Blob Storage or Google Cloud Storage). Printix App sends a release-document request to Printix Cloud. The user’s record of pending documents is consulted to determine where the document is stored. Printix Cloud sends the release-document request to the Printix Client on the user’s computer. Printix Client on the user’s computer decrypts the print data and sends it to the designated printer.